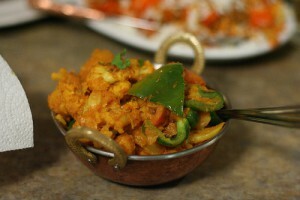 ‘Dal’ in Indian cooking refers to porridge-like dishes made from dried legumes – usually split peas or lentils. Dal is often served in a thinned state as a soup, but equally often it will be a thick, hearty side dish. 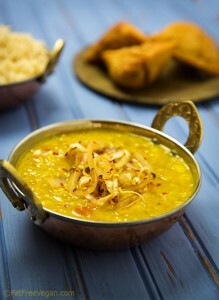 This is a thick dal, comprehensive and highly spiced enough to be the focus of a meal. 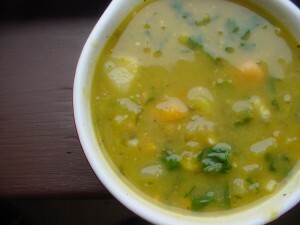 Leftovers can be thinned with a little water and served as a soup. I serve this as an entrée, over brown rice. Place split peas, ginger slices, garlic halves and water in a soup pot or Dutch oven Cover and heat to boiling point, then reduce heat and simmer very slowly, partially covered – stirring intermittently- until peas are quite soft for about 60-70 min. Add more water as necessary. Meanwhile, place a medium saucepan over med heat for a min, than add oil and swirl to coat pan. Add all of the spices and cook, stirring, for a min or until they become fragrant. Add the onion, minced garlic, minced ginger and 1 tsp salt.and stir so the onion becomes coated with the spices. Turn the heat to medium-low and cook, covered until the onion becomes very soft. Stir in the lemon juice at the end. Add this mixture to the simmering split peas, stir to combine. add extra veggies and cook until they are done. fish out the ginger slices and serve with rice. Place cauliflower florets in water to soak for 30 minutes. Drain just before adding to pan. Boil potatoes in their skins until almost tender. About 15 minutes. Cool, peel, and cut into 1 ½ inch pieces. Set aside. In deep, non-stick skillet, heat oil, mustard seed, and cumin seed over medium heat. When mustard seeds pop, reduce heat to medium low, add ground cumin and coriander, and cook for 1 minute. Add ginger, return heat to medium, and cook, stirring for 10 seconds. Add cauliflower and fry for 3 minutes. Add 1 Tbs water, stir well, cover, and cook 4 minutes. Add potatoes, turmeric, salt, and cayenne. Stir gently to coat the vegetables with spices. Add 3 tablespoons of water. Stir once and cover the pan. Reduce heat to low and cook for 4 minutes, or until potatoes and cauliflower are tender. Add the cilantro and toss gently. Serves 4. Serve with raw vegetables like carrots, cucumber, sprouts, and tomatoes. Put the lentils, water, and next 7 ingredients (through salt) into a pressure cooker(see Notes below for regular stovetop cooking). Cook at high pressure for 10 minutes and allow pressure to drop naturally for 10 minutes. Open lid carefully and check to make sure lentils are tender. If not, continue to cook without pressure until lentils are fully cooked. Add garam masala and stir vigorously to make the lentils creamy. It should be a medium consistency, so add a little water if it’s too thick. Keep warm. While the lentils are cooking, heat a small non-stick skillet. Add the onions and cook, stirring often, until they begin to brown. Add the red pepper flakes and cook until onions are softened and touched with brown. Check the seasoning of the lentils and add additional salt and garam masala to taste. Serve over rice and top each serving with the browned onions. 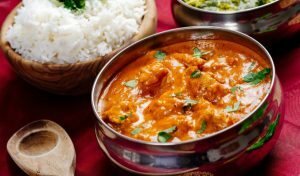 If cooking without a pressure cooker, bring ingredients to a boil in a large, heavy saucepan, reduce heat to low, and cover. Cook until lentils are soft, stirring often and adding water if they start to get too dry. Different types of dal take different amounts of time, so allow at least 30 minutes.